Everyone likes seeing Spider-Man face down interdimensional threats, man-eating reptiles and crazed octopus-people, but the thing which makes Marvel's premiere hero such a hit? The fact that he's a relatable, down-to-earth, regular guy. Apart from all the aforementioned superheroics. In that light, perhaps it's not surprising one of his most popular comic book appearances features none of the above, but simply a visit to a young fan. Before we can get onto such heartwarming scenes, of course, we need to see Spider-Man fight somebody. In this instance, the villainous menace our friendly neighborhood webhead is attempting some conflict resolution with is Thunderball, a former scientific genius who nowadays ruins buildings with his super-strength, nigh-invulnerability and great big wrecking ball he drags around with him. Just as all our greatest minds do eventually. Spidey's on the scene (on the lookout for the most recent Hobgoblin's hideout) in time to stop Thunderball from totally destroying the surroundings of his own HQ. After calling in reinforcements, the wallcrawler makes off with the enchanted crowbar – it's inexplicably imbued with Asgardian magic – from which Thunderball draws his power. The chase ends once Spidey manages to lead the bad guy to the local power grid, where his powers short out and Thunderball is knocked unconscious, ready for the awaiting police to take him away. Of course, in classic Spider-Man fashion, the assembled crowd don't thank the hero for saving the day – they're annoyed that his little scrap with the villain has “helped cause the worst traffic jam in the history of Eastern Long Island”. These People and their priorities, eh? Things shift gears considerably once all that's over, with the web-slinger hitching a ride back to New York in the back of a pick-up truck. Over the page, we're introduced to our real protagonist – the titular “Kid Who Collects Spider-Man!” – thanks to an excerpt from a Daily Bugle column. Timothy Harrison, we're told, is “sharp, likable, and nine years old... going on thirty-five.” Whilst he shares a lot of common interests of kids in the eighties (the Mets, New Wave music, Star Wars), there's one obsession that sets him apart: Spider-Man. 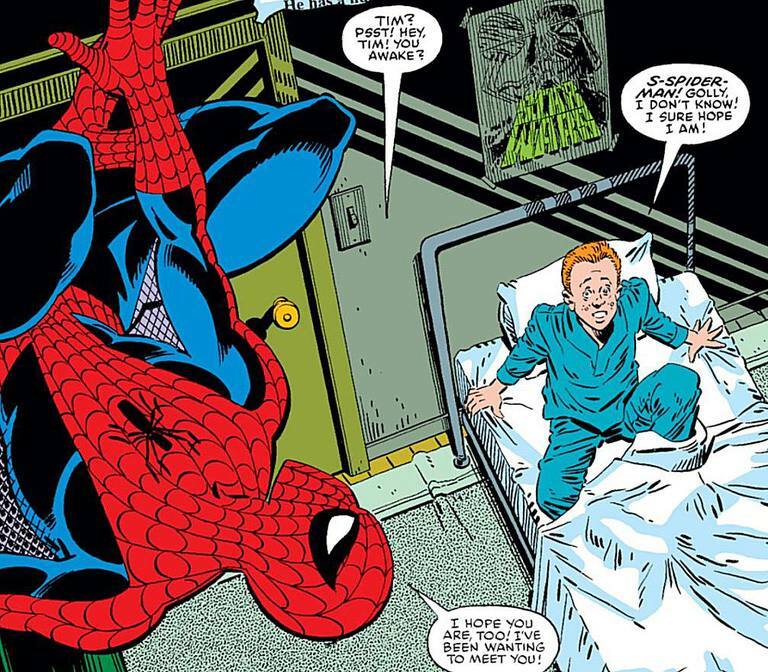 It turns out that, what with Peter Parker being in the employ of the Bugle and all, he read the piece of Tim – “he prefers not to be called Timmy” – and pays the lucky kid a visit in his home, proving that he's the real deal by climbing the walls, skittering beneath Tim's bed and lifting it up with one hand. Spidey's there to see Tim's collection, detailed in the newspaper: “eight big scrapbooks overflowing with magazine and newspaper clippings, kinescopes of Spider-Man's rare television appearances, and a handful of souvenirs that can only be unique”. So what? Has the webhead dropped by purely for an ego boost, perhaps as a result of the frosty reception following his incapacitation of Thunderball? Perhaps. But soon it becomes clear he's got some info Tim's missing from his collection: namely, his secret origin, which he recounts to the dumbstruck fan. He even gives a basic explanation of how his web shooters work, creating a makeshift hammock in the corner of the room. Spidey goes even further than that, however, continuing the tale of how he became a hero with the tragic, unavoidable death of his Uncle Ben. The death which put him on the path of becoming a do-gooder, with the motto “with great power, there must also come, great responsibility”. 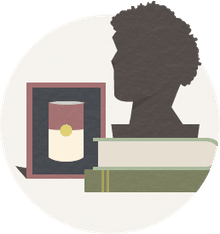 Tim digs even deeper into his collection in return, fishing out a jar containing squashed .38 bullets – chiseled out of a wall after a bank heist which our hero thwarted, his Spider-Sense allowing him to dodge out of the way of the bullets being fired at him. After that, and a giggle at the one time J. Jonah Jameson had to reluctantly print a retraction of one of his many anti-Spidey screeds (the time he claimed the hero was actually Electro), it's way past Tim's bedtime. The webhead is on his way back where he came from – through the window – when Tim asks for one more thing: to know Spider-Man's secret identity. With some hesitance, he honors Tim's request. Peter Parker takes off his mask, making his young fan one of the few people aware of his double life. He's instantly recognized as the guy who took all those photos in the scrapbooks, and Tim promises to keep the secret as long as he lives. Spidey swings off into the night, and that's when the pulled gut punch of the comic is at last unleashed. As he leaves, the hero vaults over a wall bearing the sign “SLOCUM BREWER CANCER CLINIC”. One last excerpt from the Bugle article on Tim confirms the truth of the meeting we just witnessed: “You see, Tim Harrison has leukemia, and the doctors only give him a few more weeks to live.” He's one kid Spider-Man couldn't save, but at least he could indulge his dying wish. Then-regular Amazing Spider-Man writer Roger Stern was joined by Ron Frenz and Terry Austin on “The Kid Who Collects Spider-Man!” (with the main Thunderball story handled by John Romita, Sr. and Brett Breeding). Stern was making a conscious decision to do something different with the short backup story, admitting years later “I just woke up with the idea one morning ... and had the uncomfortable feeling that it must have been some early Superman story that I'd read when I was younger. In fact, I went around for about a week, telling the story to people at Marvel and asking if they could remember such a story. “Partly, I'm sure that it sprang from a desire on my part to do a short human-interest story in the style of Will Eisner – that's why the story is partially advanced through newspaper clippings...I was trying to be Eisneresque.” Will Eisner, for those who don't know, being a pioneering comic artist/writer behind early newspaper hero The Spirit, the progenitor of the term “graphic novels” and one of the most talented and prolific creators in the form. Well, if you're gonna steal, steal from the best! Standing out so assuredly from the pantheon of Spidey stories, “The Kid Who Collects Spider-Man!” routinely appears on top ten lists of comics starring the character, has been reprinted umpteen times and was loosely adapted for a two-part episode of Spider-Man: The Animated Series in 1996.